REDSTONE ARSENAL, Ala. -- Command Sgt. Maj. Kyle Crump has been involved with several Arsenal projects during his two years of service with the Garrison -- Newcomers Briefing, Readiness and Resiliency training, the Transition Assistance Program, JROTC Day, NCO Call and Better Opportunities for Single Soldiers or BOSS, to name a few. But most of Redstone Arsenal knows him as the face of IceBox, a weekly feature in the Redstone Rocket where Crump provides answers to employees' most pressing questions about the Arsenal. That face will be leaving Team Redstone soon as Crump prepares for retirement, saying goodbye to a 31-year Army career that has been filled with plenty of teamwork, camaraderie and leadership opportunities. Crump will retire during a change of responsibility ceremony Sept. 26 at 10 a.m. in Bob Jones Auditorium with Garrison commander Col. Bill Marks officiating. A retirement dinner will be held Sept. 25 at The Summit. "I've always been told that you will know when the time feels right to retire. And this just feels right," Crump said. "But even in retirement I hope to find another job where I can work in support of Soldiers. Dealing with Soldiers, that's what I know." Crump's retirement will take him back to the Fort Hood, Texas, area, where his wife Kimberly, a civil servant, has kept the family home during his assignment at Redstone. "We've been apart on and off for 31 years because of my service," Crump said. "It will be good to be together and to catch up with family. And, on top of that, my daughter, who lives in North Carolina, and who got married this past summer, just found out she is expecting. My oldest son, who lives in Killeen, Texas, where I will be returning to, and his fiancee are also going to have a baby. So, there will be grandbabies in retirement." Crump's time at Redstone has helped him prepare for his eventual transition into the civilian workforce. "I've enjoyed learning the business side of running an installation and working alongside Col. Marks and our outstanding civilian workforce here," he said. "You don't get that kind of experience in the Army's infantry organization. This assignment has helped tremendously with getting ready for the transition and working with civilians here has made the ultimate decision to retire and become a civilian myself much easier." Besides serving as the Garrison's command sergeant major, Crump has also served as the command sergeant major for Team Redstone's senior commander, Lt. Gen. Patricia McQuistion. While the dual role has kept him busy, Crump has still made time for leading Soldiers and civilians through activities and events that have improved on the quality of working and living at Redstone. "It was a tough decision to actually say, 'OK, I'm going to leave Team Redstone' because it has really been a great experience for me," he said. "It was a blessing to come here and learn what actually goes on at Redstone Arsenal, and what impact the employees here have on Soldiers and on the national defense." That's saying a lot for an infantry Soldier who had not heard of Redstone before he arrived here. "It wasn't even a fort. Not being a fort, I had no idea of what Redstone Arsenal was or what was done here," Crump recalled with a smile. It didn't take him long to get up to speed or to find his place, developing new Garrison services, restarting existing programs, and supporting all the activities and events that make Redstone a unique and interesting place for Soldiers, employees, retirees and on-post residents. He was part of the Garrison's leadership during a time of major reshaping of the installation, a time when both the One Stop and the Welcome Center opened, Arsenal tenants were physically reorganized for better efficiency and effectiveness, the Redstone Gateway opened and major road construction got underway. "This is an exciting installation to be part of," Crump said. "It is interesting to work with all the different tenants and to be part of the changes going on here as Redstone has become recognized nationally as a federal installation." For Redstone, Crump used his team building skills to make a difference as part of the Garrison team. "The camaraderie and teamwork that I enjoyed in the infantry is what I wanted to bring here," he said. "Teamwork is never a question. That's what is required if you are going to survive in combat. That's also what is required to grow and expand the services provided by the Garrison and to grow the footprint of Redstone Arsenal." During his Army career, Crump enjoyed the training and the different assignments he had throughout the world. He and his family have moved 17 different times, with assignments in places like Fort Benning, Georgia; Fort Wainwright, Alaska; Fort Hood, Korea, Germany and Iraq. "The passion of the Army gives you that feeling of challenges and accomplishments, and that's what keeps you going," he said. "It keeps you going even in places like Iraq, where leaders must be especially patient and control their stress, especially in front of their Soldiers. If a leader is struggling, the Soldiers pick up on that stress and lose confidence, they think their leader can't handle it." Crump deployed in 2008-09 with the 3-21 Infantry Stryker Battalion to Operation Iraqi Freedom, where he served as the battalion command sergeant major at Forward Operating Base Normandy, located on the edge of Muqdadiyah and the Diyala River Valley. "Our biggest challenge was to train our Soldiers to not be complacent," he said. "People's mindset changes, and you can't do the same thing every time. You've got to be on your toes, even if you are in a familiar place. You can't take shortcuts. You have to do things the right way every time." Crump, whose military awards include a Legion of Merit along with the Sergeant Morales and Audie Murphy awards, served through three defining Army eras -- the 1980s as the Army was transitioning from the last of the Vietnam era, the '90s during the Army's growth in professionalism, and the 2000s during a time of war and moving toward a leaner Army. Among his favorite assignments was his very first out of basic training, when he served with the 6th/502nd Infantry Battalion in Berlin, Germany, from 1984-87. As a young Soldier, his platoon of 53 Soldiers patrolled "the wall" between west and east Germany, and were the last Soldiers to guard Nazi war criminal Rudolf Hess, who died in 1987. His next assignment -- at Fort McClellan where he trained Soldiers in mapping and communications as part of the Basic Training Committee Group and served as a drill sergeant -- was another favorite, where he enjoyed mentoring Soldiers. 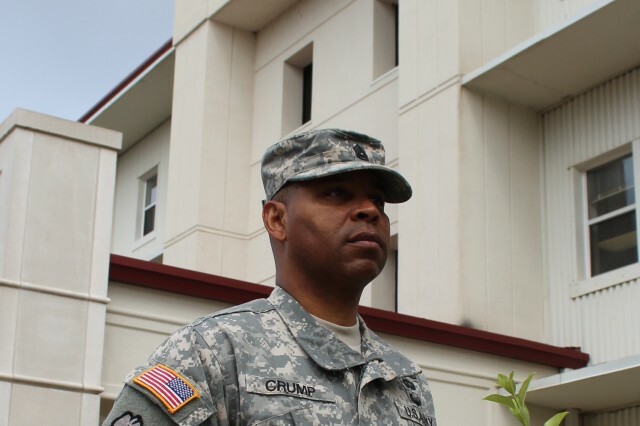 Crump's role as a trainer continued in Hohenfels, Germany, where he was assigned in 1991 to the Combat Maneuver Training Center, 1/4th Infantry Battalion, 7th Army Training Command. From there, Crump took on a series of unit leadership positions, all focused on preparing Soldiers for combat. He served with units at Fort Drum, New York; Schofield Barracks, Hawaii; Fort Benning; Camp Casey, Korea; and Fort Wainwright. Other assignments had him serving as a ROTC instructor at the University of California in Santa Barbara and as the Scorpion team command sergeant major at the National Training Center at Fort Irwin, California. 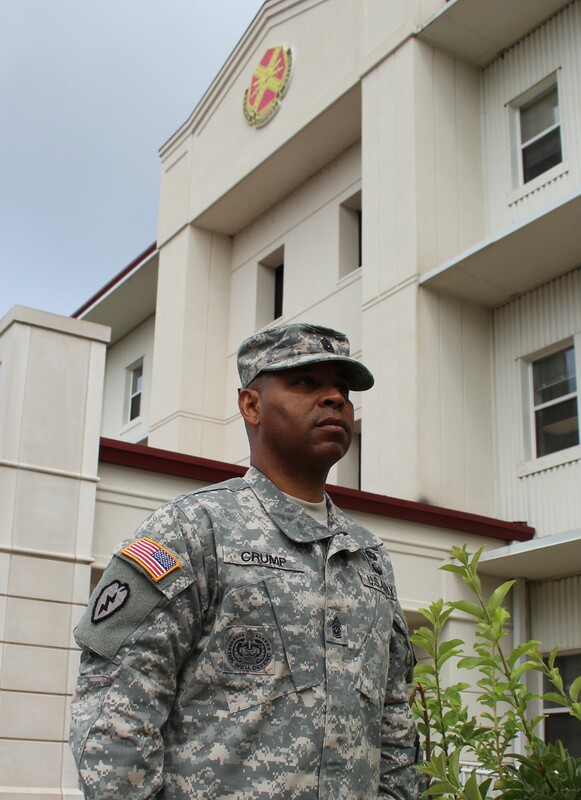 Following his deployment to Iraq, Crump went on to serve as the brigade command sergeant major for the Warrior Transition Brigade at Fort Hood. "So many of my assignments involved teaching Soldiers how to be Soldiers. It was a great experience for me because you have this young kid in your hands and then you actually get to mold him into a Soldier. Growing them into a Soldier, seeing them grow in their training and discipline, is very rewarding," he said. Crump was himself a teenager when he joined the Army. "I've learned so much. It helped me to be well-disciplined and competitive. It helped me with my people skills and communication," he said. "I thought when I joined I would only be in for three years. But I just kept going because as time went by I was having fun. It's really been a blast. There have been so many more good times than bad times. 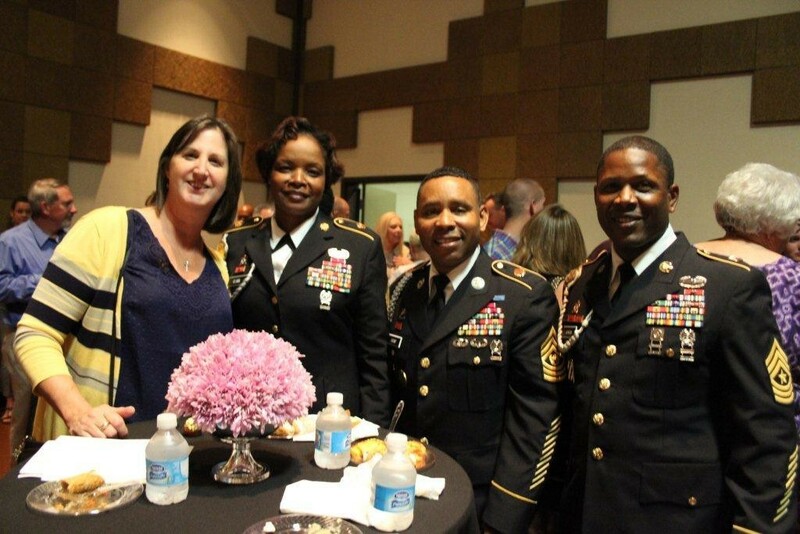 The Army has been a family to me and my wife and our kids." For most Soldiers, the time and experience of serving in the Army's enlisted ranks gives them the background to become good leaders. Such has been the case for Crump. "First, you have to be a good follower," he said. "Then, as a leader, you have to have open communication skills, you have to know how to listen before giving instructions, and you have to treat people with dignity and respect, and always, always be a team player." Besides the character and qualities of leadership, Crump said, when it comes down to the basics of any job, the first priority should always be "to do your job." "That's what people need," he said. "They need you to do your job, and that means following through on your responsibilities, making sure all your duties are done and done well, and leading others with respect. "I've never been a yelling NCO. I think that's degrading. When you have a Soldier -- or an employee -- who you are disappointed with, you should talk to them and let them know what you expect from them. That has more of an impact than an outburst of anger. You need to let them know they didn't live up to the standard, and that you want them to strive to do better. You don't want to tear them down to build them up. You want to leave your door open to them so they know they can come to you for mentoring, teaching and counseling." Through his entire career, Crump has leaned on his wife for support, and he is thankful to her for taking care of the family's moves and for raising their three children. "She has kept me grounded and focused on what I need to do," he said. "She has been there for our kids. None of them have ever complained about all your moves. I've seen how those moves have helped my kids in broadening their people skills. They can make friends at the drop of a dime." Through all the changes Crump has seen in the Army during his career, he said the backbone of the Army -- the need for competent, disciplined, motivated and smart enlisted Soldiers -- has never changed. "In today's Army, you have to be well-disciplined, physically strong, informed about the Army's changes and the best of the best to re-enlist," he said. "Even with the Army downsizing, there is still opportunities for Soldiers to advance in their careers. That's not going to change. It may take a little longer to advance, but if you are a disciplined and committed Soldier you will advance. "The Army needs Soldiers who are well-disciplined and good followers and leaders, who maintain the standards, who keep abreast of regulations in their career field and who are the subject matter experts in their craft. Soldiers are part of the best Army in the world. They should not take that for granted. I have always believed in the slogan 'Be the Best You Can Be.'"